Many things affect our health. How much we exercise, what and how much we eat, and also, although we may not think about it, how we think can also affect our fitness level. Kombuchu tea is a probiotic food that contains bacteria which benefits the immune system and the digestive system. The health benefits of Kombuchu tea include a detox effect as well as immune system boost. The natural fermentation process of the tea also brews a little alcohol....a very very trace amount, so don't get excited! Many people that consume the tea regularly claim more clarity, energy, and a general feeling of well being. Kombuchu tea generally begins from a big pancake referred to the mother or a scoby. 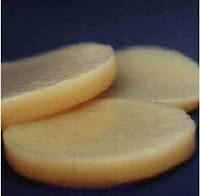 The scoby is the starter and looks somewhat like a grey spongy mushroom. The mushroom consists of a symbionic colony of bacteria and yeast. To brew the scoby black or green tea is brewed, then mixed with sugar, allowed to cool, a little white vineger is added (acetic acid), pure water, and then "scoby" is added. The glass or ceramic container is covered with cheesecloth, put in a temperature controled dark place, and allowed to "brew" for 10 to 20 days. The yeast in the scoby feeds off the sugar which makes the healing probiotics and voila Kombuchu! The longer the tea brews the stronger it will be. The tea will often taste tart, tangy, mildly vinegary, and carbonated. Another great benefit is that it can be flavored after brewing is done. Matt this is for you.